Fun, quirky, and easy going but is it a hit or miss? CBS new tv series The Fam is a comedic sitcom about a charming couple, Clem (Nina Dobrev) and Nick (Tone Bell), whom seemingly have a normal, run of the mill life. Set in the modern day, the show opens up with an overly excited Clem, jittery about her engagement announcement with the in-laws. It’s clear that this is a happy day, however, when Clem and Nick head back home, they are in for a fun surprise. In comes Shannon (Odessa Adlon); Clem’s goofy and free-spirited half-sister whom she hasn’t seen in years and their cop father, Freddy (Gary Cole) who hasn’t exactly won father of the year, reuniting as a family again. From there every episode is a glimpse into this family’s life and their funny circumstances. The Fam aims to be about everyday life that most viewers could relate to; parenting, dealing with funny antics from teenagers and finding the time to nurture a romantic relationship while taking on the parenting role. An awkward family reunion, a sweet sisterly bond, and lots of funny moments is the perfect combination for a comedy tv series, but will all the funny antics and quirky moments be enough to keep this show alive? While each episode seems to breeze through in 20 minutes, the script makes it hard to relate to each character on a personal level thus making every episode a bit of a task to get through without feeling disinterested after a while. This tv show isn’t meant to be deep or dramatic, but every good tv show has characters that the audience can relate to, that is essentially what gives any tv show life. However, the lines that were given to each character, aren’t exactly things that people would say in real life, therefore people can’t relate to the said character as much. Words like “Gucci” and the like only seem to cringe-worthy and aiming too hard to relate to the 14 or 15-year-old teenage audience but not really the grown adult audiences that are most likely the average viewership. On top of that, the actual adults in this show, try too hard to be young and “hip” instead of being young and original. Everyone is unique in their own way, adults and teens alike, so why not show that instead of dragging these actors into cliché punch lines and stereotypical circumstances? The only redeeming aspect of the show is crazy, over the top little sister who is portrayed as the stereotypical teen, whom of course steals the spotlight in the show. Outside of that, this really is the tried and tired comic routine and walks on the typical line that most comedy shows walk on these days. There is stereotypes, drug references, and cheesy punch lines, which waters down the potential premise of this show and does the amazing group of actors no justice. Currently, it has a 40% on Rotten Tomatoes with only 5.8 stars on IMDb. Potential is there but doesn’t quite hit the nail on the head…yet. Overall, The Fam can be just a relaxing Television show to unwind or doze off to, if given the chance, the Television series might just redeem itself later in the season. 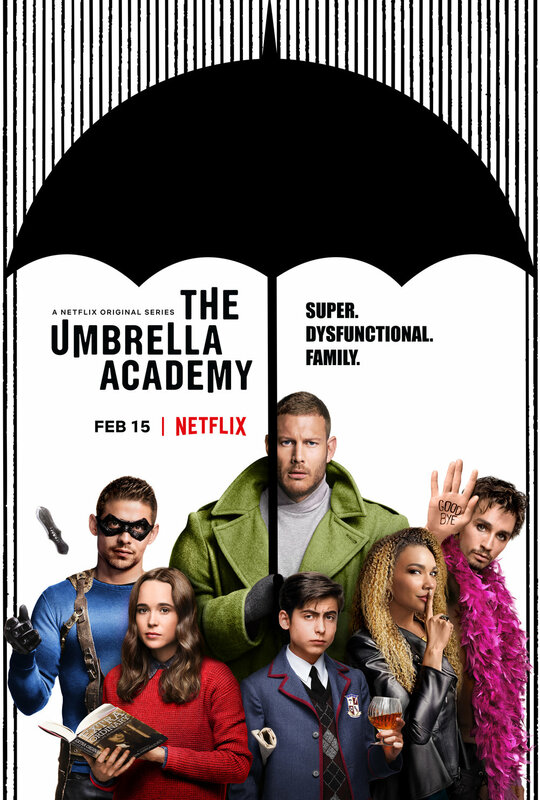 Netflix’s new series The Umbrella Academy is a whole lot of fun and kept me on the edge guessing the plot of this show so far. The first episode starts off a bit cute then turns to a whole lot of weird and it left me with lots of questions. To put it simply, on the first of October in the year 1989, 43 women around the world gave birth, however these women were not pregnant on the beginning of that specific day. Let that sink in. From there a strange older man by the name of Reginald Hargreeves (Colm Feore) sought out to adopt seven of these special children and raise them to be “extraordinary” superheroes. Simple premise, right? No. It gets a bit more intricate than that as the episodes unravel bits and pieces of a bigger puzzle. The first episode meets only six of the seven heroes that come together for their father’s funeral: Luther (Tom Hopper), Diego (David Castaneda), Allison (Emmy Raver-Lampman), Klaus (Robert Sheehan), Vanya (Ellen Page), and “Number 5” (Aidan Gallagher). While they are at their family home, they discover something is off about the way their father died, which introduces the audience to the plot. However, what is strange is the focus on their father’s missing manacle, which apparently, he never left behind. Their “mother” seems to be a malfunctioning robot, and “Number 5” came back out of seemingly from the future where everyone in the world is dead. From that point onward, it is one strange ordeal after another, that somehow connects. This also a talking and very intelligent monkey who is now in charge of their home, which I found intriguing and delightful. Planet of the Apes, anyone? All jokes aside, not only are these ordeals strange, but somehow it feels like the show is trying to feed me clues to keep note for future episodes. Or at the very least keep me guessing. Which brings me to my next point; the atmosphere. I want to really emphasize that the atmosphere of this show isn’t the typical “superheroes saving humanity”. This show is gritty, dramatic, and strangely comical. The creators of this show creatively strip down the cliché superhero stigma and gives each of these characters realistic human strengths and flaws, while revealing bits of the story one episode at a time, keeping me hooked from episode one. I found myself trying to figure out the plot, all the while watching a dysfunctional family trying to come together. However, instead of acting like a family, they are all estranged and almost self-absorbed in their own way. Which is okay in my book because it adds to the drama and creates potential for character growth. However, this show isn’t all drama. In fact it aims for that perfect combination of comedy, drama, and action, and let me tell you, some of these characters are sparky and comical. Characters like Klaus and Number 5 will have you smiling, giggling, and shaking your head all at once. While other characters like Vanya will tug at your heart strings and make you feel for her. Although to be fair, Ellen Page easily does that with any role she plays. Lastly, the action. The action in this show is not immediate, nor is it overdone with CGI or fast-moving shots. The action really starts taking place in episode three and onwards. While it is not over done, by no means is it not absolutely attention grabbing and exciting without being over exaggerated with superpowers or guns a blazing for five minutes straight. Drama? Check. Comedy? Check. Action? Check. This is specifically a Netflix series with ten episodes, each about an hour long, and is honestly one of those series that can be a hit or miss for most but must be given a chance. You’ll know when you stumbled on a good show when it baits you to continue episode after episode and this is exactly what The Umbrella Academy does best.